Thanksgiving weekend is a great time to sit back, reflect on the year and count our blessings. I’m thankful for so much…including this blog. Thanksgiving weekend is also my Blogs birthday, it’s 5 years old this weekend…and I can’t believe all the truly OUTSTANDING things that have happened thou this blog. I’ve made great friends, they have touched my life. They have inspired me, pushed, and challenged me. I’ve made an impact with others. My most cherished accomplishment with the simple words that I write here, I’ve been told that my running and my blog has touched the lives of others. I’ve run races I only dreamed about, and some I never truly imaged running, but the runners I follow inspired me to stretch my goals. This blog has had over A MILLION viewers….and over 750,000 since I moved it to my personal domain, two years ago. This simple parking spot on the web, has opened many doors for me. When I hammered out my first post, I wondered if anyone would read it. 5 years later I have had two of my works published in a National Magazine. And I have nearly finished my first novel, a story of Life, Love, Loss and Endurance Running. It’s a fictional story but based loosely on my life. Thank you to all my followers, friends and virtual running partners. We may never get to run together, we may never met in person…but we have shared a great deal of my running and life together. I look forward to the next five years and beyond. This entry was posted in Uncategorized on November 28, 2014 by burk.brian@yahoo.com. JFK 50 – Seems like only yesterday I was filling out an application by hand, writing my name on an envelope, applying a “Forever” stamp and mailing in my request to run the oldest continuously run ultra marathon in the U.S. Now as you read this I’m sitting back trying to collect my feelings about my finish and this race. I’ll start off by saying this was an awesome event. I found the race very organized, well supported and everyone I came into contact with was very welcoming. I also found this race more challenging then I had anticipated. My JFK 50 plan and goals were previously posted here. Bottom Line, I finished my first running and the 52nd running of the JFK 50 Mile Endurance Race in 10 hours, 06 minutes and 27 seconds. The Start and the Appalachian Trail section: Race morning began with a pre-race briefing in the Boonsboro high school gym and then a short walk to the center of this historic town. Up to this point this felt like any other early morning race, even with the chilly (19f) temperatures. Once standing in the center of town, listening to our national anthem, things got real. All of a sudden it hit me, I’m running the granddaddy of all ultra races. This thought barely had time to sink in and the gun went off. As we made our way out of town, I remembered I had trained hard, was in good shape and happy to be finally running this great race. In the early steps of the day, I believed I was ready for anything. Video note, I smudged the lens with my glove at some point and did not realize it until after the race was over. Myself along with the pack of nearly 1,000 runners made it’s collective way out of town. It wasn’t before long that I noticed that the road began to rise. What I was not ready for was the opening miles running uphill on the roads leaving Boonsboro and approaching the AT. Some how I missed planning for this <sarcasm> “easy” </sarcasm> section. I knew it was very early in the day and with the excitement and the increase in elevation my heart rate was going up faster then I expected. I soon began to worry about burning out to early. Wanting a tapered start I choose to fast hike some sections of these early miles, reasoning that any time I lost here I would be able to make up on the flat/tame tow path. Little did I know what shape I would be in when the tow path came around. Timing Mat #1, Start of the AT, 30:37: Honestly I had no idea what to expect from the AT section. I knew there would be some climbing, I knew there would be some down hills and I knew the footing would be challenging. Once on the AT, I was ready for the challenges I’ve previously mentioned. I was not ready for them all at once. I was also not ready for the narrow passing lanes. I’m not trying to imply that I’m a fast trail runner, but at this point I was ready to make up some ground. Even with the challenging footing I felt like I could run a quick if not steady pace. The only problem was the single track trails made it difficult to get around people. I lacked the confidence to pull out of the single file lines to make any forward progress. At times I also felt like I was holding people up. The footing on the AT was much more technical then anything I had run on before, this slowed down some of my progress early on. It was only when I was able to link up and tag along on a fast moving train of other runners was I able to make up some time. As hard as the AT trails were I enjoyed the challenge as it kept my attention the majority of time. The few times my mind/attention did wander off I was abruptly called back to reality by a miss placed step or a toe impacted right into an awaiting rock. I caught myself from falling a number of times but never made contact with the very jagged and hard rock surface of the trail. I did witness a few other runners who were not so fortunate. The miles on the AT passed relatively fast as there was not a lot of idle time. Exiting the AT would offer up one more opportunity for disaster. Approaching the exit stage of the AT, “Weaverton Cliffs,” a course marshal was posted at the beginning of the infamous switchbacks. This section was fast, steep and required all of your focus. The very attentive marshal offered up some words of warning. “If things are going to go bad for you, it’s going to happen here and it’s going to happen FAST.” And he was not lying, the switchbacks were fast and had very little room for error. One wrong foot placement, one miss step or rolled ankle and you would have been tumbling down the AT trail with a resting place among the trees, rocks and potentially on a landing surface 100 feet below. During this section my eyes were glued to the trail and the shoes of the runner in front of me. A crash on this section would have been bloody and ugly. NOTE: It was reported that one unlucky runner met such an unfortunate fate. I heard after the race that a JFK runner tripped on these switchbacks and in the fall the gentlemen suffered a busted lip, banged up nose and swollen face. Reports had him tripping on the switchbacks and going face first down the side of the trail and slamming into a tree. After first responders patched him up, he proceeded on to the C & O Tow Path and ran another 36 miles. Witnesses said it was very bloody, later I was glad to read this 68 year old Vietnam/ Marine Corp veteran finished his 26th JFK, but had to dig deep after the fall. The Canal Path: Approaching the Weaverton aid station I could finally divert my attention to something other then foot placement. At less then a third of the race distance, at 15 miles in, I could not believe how compromised my legs felt. My thighs/quads were wasted, it felt like I had just completed 10,000 squats. My legs felt heavy and weak, just when I needed them to come alive. I just could not believe I had 35 miles to go. My legs were a complete mess. In my initial planning for the race I had a goal of getting off the AT in under 3 hours. I came off the AT much slower and in much worse condition. I knew this section was going to be challenging after all we have nothing like these conditions around the 757. To counter this I planned some training time in the mountains, but these got cancelled for logistics and support reasons. Knowing all of this I hoped that surviving the AT I could make up some time on the tow path. But with the state of my legs I had to settle into a 10 minute run and 2 minute fast walk pace to gain some recovery for my beat up wheels. This was very humbling, but at the same time just what I needed to rebound. The next 27 miles of tow path running were spent playing mental games within myself adjusting my running/walking routine to pick up the pace to gain back some time that I felt I lost on the opening sections. Slowly life came back to my legs and my spirit. The support along this section was outstanding, the majority of the miles were very lonely with limited crowd support but when you did come across an aid station the energy and enthusiasm propelled you over the next few miles. I found all of the volunteers very supportive. I also came across some very interesting characters along the way. I missed out on the red velvet cake, at the 38th mile aid station. I was battling with my stomach just a bit and although this cake looked wonderful, I just could not bring myself to try any and risk upsetting my stomach along the trail. The Road to Williamsport. Coming off the tow path it was refreshing for my feet to impact and run on pavement. The level surface was welcoming, it made my legs feel fresh and alive…unfortunately that only lasted a short time. These finishing miles are run over very rolling terrain that normally I would be able to power up and accelerate down. In the closing miles of the JFK, after a beating from the AT and the droning of the tow path, I had to settle with fast hiking up anything that looked, smelled or may have been an uphill. I was able to run the flats and down hill sections, pleasantly surprised that I was able to keep up a solid 9:00 mile pace while averaging my mile splits right at 12:00 miles. Crossing the JFK 50 finish line can only be compared to crossing the finish line at Umstead. At the end of this race I truly felt like I had accomplished something, not simply ran another race. Maybe it was because the course was a true challenge in every essence of the word. Maybe it was because the JFK 50 felt like a right of passage for me as an Ultra-Runner. Whatever the reason I’m very proud of my finish, 415 out of 912 starters, 10 hours 06 minutes and 27 seconds. I toed the starting line hoping for a sub 10 hour finish…without truly understanding the challenge the JFK 50 offered up. I crossed the finish line knowing I met every challenge throw my way. At points I wish I would have done better, wished I had been better prepared but knowing I gave it my all. Will I come back for a rematch….I said a number of times that this may be a race where I’m one and done. 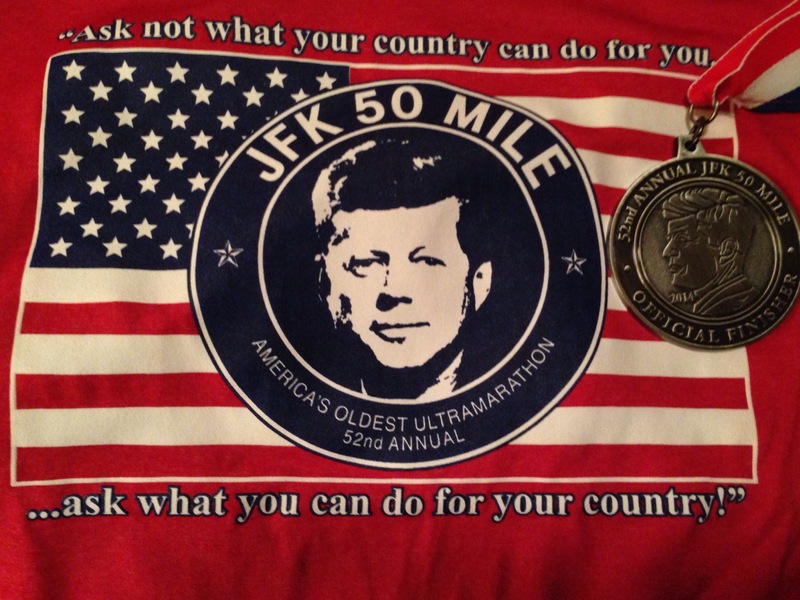 But the JFK 50 offered up another challenge, can you do better? Will I be back…..you bet ya! As always my loving wife for supporting my crazy adventures. Chris and Brad for the ride to the High School….Congrats on your finishes! Brad and Vickie for the ride back to the hotel…Thanks so much! This entry was posted in Uncategorized on November 26, 2014 by burk.brian@yahoo.com. I’ve said many times, I’m a blessed and lucky guy to have Michele in my life. We recently celebrated our 24th year together…and I wanted to get her a unique anniversary card…..so I made my own. This entry was posted in Uncategorized on November 19, 2014 by burk.brian@yahoo.com. Running Has Helped My Weight Control. Contrary to a published report on the HuffingtonPost, (Sorry but I have a hard time taking anything with the name Huffington seriously) on running and weight-loss, I do believe running is idea for weight control and in fact I offer my 5 ways running has helped me lose my unwanted pounds. 1. The Long Run. During a typical long run (15+ miles) I’ll burn anywhere between 1,500 and 2,000+ calories. I average two long runs per month. I don’t care who Huffington is…that equals weight-loss. Now you have to be smart about it…you can eat your way through your long run with just one visit to whopperland, but if you stick to a sensible diet, sensible portions and work on getting in your long runs…you will lose weight. 2. I no longer view food as entertainment. Since changing my view of myself as a runner, (Ultra-marathoner) to an athlete I now see food as a source of fuel and recovery. I need fuel to power the machine and heal the body. In the past a cup cake was a good snack…or a whole meal, today I balance what I eat to build a fuel supply for my next run/race or recovery from a hard work out. And when I’ve been a really good Ultra-runner…I sneak in a cup cake here, an Oreo there. You got to enjoy life some. 3. I eat better. Gone are the days of living off Pizza, Pop Tarts, Fritos and full strength Pepsi. Today I balance my meals for nutrient. Being a picky eater most of my life, I resisted the attempts of others to get me to try food that was “good for me.” Today the runner side of me has opened my world to a wider choice of things to eat. I’ve tried new foods, new dishes, new styles of food, just because they were a good food source for an athlete. 4. I don’t just run, I train. I hate to admit it, but I do just run…I don’t lift weights or do cross-fit or work on core. I want to, but my life style is so limited on free time that when I have “the time,” I Run. But I “train” while I run, if you run at the same pace, same distance every day, day in and day out, your body will get used to the effort your putting out and your weight loss will become stagnant. I vary my run, and my training. I run long on the weekends, and my week day runs are a mixture of speed, hills, tempo and recovery. I also vary the distances I run, 15+ on weekends, double digit at least once during the week and maybe twice if I have the time and solid 7+ miles the rest of the week. I average 5 to 6 days a week, covering 50 to 60 miles. I also vary the training pace of my run. Some days are fast, some days are slow…but normally every day I’m finishing at a pace faster than when I started. 5. The Competitive Edge. My body is no longer just a vehicle that drags me around from place to place…it is now my weapon of choice to prove I still have it. I’ve really focused over the last six months and lost 20 pounds. I feel so much lighter during my training and especially on race day. When I get on a scale it is not just to monitor my love handles, it is to check on the status of my racing machine. Now I’m no fitness expert, I do not have a medical degree, I’m not professionally trained, I have stayed at many Holidays Inns, but I’m not a running expert. I can only tell you what has worked for me. And that is Running, Endurance type running has helped me maintain my weight over the last 15 years. I’ve had some up and down times over these years. I have the type of metabolism that as soon as I stop running my weight control goes out the window and my eating habits go with it. When I’m running my weight/eating habits are balanced. And over the last year of focusing on Ultra-Running…I have really noticed a difference in my weight, my eating habits and my running performance. Why do you do it? Is it hard? Can I do it? Does it hurt? Over the last 14 years I’ve been asked a lot of questions about running in general and specifically about my running. Recently on a training run in Pocahontas State Park, with my GoPro filming, I thought I would answer the top five questions I’m asked about my running. NOTE: Struggling a bit with Youtube upload quality….pls bear with me. How did I get started and why do I run long distances ? 2. How far, how often, and how fast do you run? 3. Is running bad for your knees? 4. Who was your favorite running partner and who would you like to run with? 5. Where do I see my running taking me? Thank you so much for watching my first video blog entry. If you have the time please subscribe to my video channel on YouTube.com. I’ve got a lot to learn about video editing…and as always THANK YOU for following my Blog and my Running! This entry was posted in Uncategorized on November 13, 2014 by burk.brian@yahoo.com. Planning a race calendar is a difficult task to accomplish. There are many variables to consider, such as: family plans, available income, vacation days, work and finally de-conflicting the race dates themselves. Last year I ran my first 100 miler at the Umstead 100 Endurance Race. Since then I’ve wanted to run another 100. But when? I first considered running another 100 towards the end of 2014, for all of the above reasons, that did not workout. The remaining months of 2014 zinged by so fast and we had other events planned, family vacations, work and other races. I could not find the time to stuff in another 100, so I set my sights on a spring 100. Then some where along the line I came up with the idea for “March Marathon Madness.” What is this March Madness I speak of? Four Marathons in Four Weeks and the Monument 10k. Now I stuck between do I run the Madness or a Spring 100. With all my other life commitments, the targeted 100 and the marathons are now conflicting? The Umstead Trail Marathon, The One City Marathon, Shamrock Marathon and The Reston Marathon? (this would include running Monument Ave 10k the day before). Wow, making these “adult” decisions is tough. What would you do? This entry was posted in Uncategorized on November 8, 2014 by burk.brian@yahoo.com. Have I mentioned I hate “Falling Back” during Day Light Saving Time. To me “Falling Back” means the days are getting shorter and the temperature is dropping. During this time of year, the most difficult part of our run maybe getting out the front door. We’re losing daylight and the warmth of the sun at the same time. To combat the effects of losing daylight it’s important to have some type of lighting equipment handy. Whether it be an old fashion hand held flash light or a high-tech head mounted LED lighting rig. If you can’t see where you’re going…you’re going to get hurt. To keep safe during night time running, I’ve tried many forms of lighting equipment. What I have found works best is something very bright and easy to hold on to. To see where you’re going…The lumen is a measure of the total “amount” of visible light emitted by a source. I selected a light source with the highest lumen rating that was easy and light enough to hold in my hand. For years I ran with a small hand held flash light. This worked great as it allowed me to direct the light beam in the direction I wanted. This versatility made it convenient to see around me and also serve as a headlight/taillight depending on where the oncoming traffic was approaching from. Two years ago I found a small hand held with an ultra-bright 145 lumens worth of light. Recently I have been using Knuckle Lights which work great and are very bright. You can read my review on this product here. To defend against old man winter and the declining temperatures which surly will accompany you need to dress warm. Dressing warm depends on having the right gear available and knowing how to use it, cause face it, if I get cold….the training run is going to get shorter. To ensure I get out on the coldest of days, and to make sure I put in the required miles, I have put together a nice selection of winter running clothing and accessories. To keep warm it’s important to keep your core temperature stable but maybe more important are your hands and for me, my ears. I hate cold hands and it’s what temps me to stay inside on those really cold days. How do I combat that? I ensure my winter running kit has a number of warm gloves/mitten available. If the temperature is on the cold side I don a pair of gloves. If it is really cold, two pairs…down right artic then I’ll slip on a pair of mitten over my gloves. My ears are another part of my anatomy that must be kept warm or I’ll find myself on the inside looking out. What works great for keeping me warm upstairs, a buff for the neck, headband with earmuffs and a nice fleece cap, again layering as needed. Other accessories to keep old man winter a bay: fleece top, arm warmers, long pants, leggings and good quality socks. No matter the distance or speed everybody needs to keep warm during your winter running routine. So remember, as the temperature drops, your miles don’t have to. Don’t take my word for it, check out these other winter running sites. This entry was posted in Uncategorized on November 6, 2014 by burk.brian@yahoo.com.